The Ministry of Culture and Information (MoCI) in the Kingdom of Saudi Arabia (KSA) is utilizing Nautel’s N+1 capabilities across 30 of its Saudi Private Radio FM sites. During 2010 they implemented a 5+1 configuration at each site for a total of 180 Nautel VS1, VS2.5, VS300 and NV5 transmitters – the largest FM project in KSA. 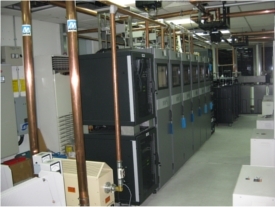 Through the Saudi-based integrator Delta Company Limited, Nautel provided the infrastructure to support the Kingdom of Saudi Arabia’s launch of 150 private radio services. Broadcasting to 30 FM radio towers, the new radio stations reach 90% of the population in KSA. In this instance, Nautel’s 5+1 configuration enables Saudi Private Radio to broadcast five, high-quality radio programs not belonging to the public network from each site. 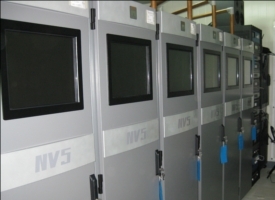 The first shipment containing 18 NV5s for the Riyadh, Jeddah and Dammam sites left the Nautel facility in Hackett’s Cove, Nova Scotia in July of 2010 and all the remaining VS Series units – 66 VS1s, 66 VS2.5s and 30 VS300s – were shipped in November of 2010. Nautel designs extreme reliability and redundancy into all its transmitters as standard, but for facilities that broadcast multiple programs from a single site, N+1 capability can provide even higher levels of redundancy that is both automated and cost effective. Nautel N + 1 configurations can support up to six identical main transmitters plus a backup transmitter serving outputs of 300 watts to 40 kilowatts of solid-state power. Wendell Lonergan, Nautel Sales Manager for the Middle East, describes the advantages of using Nautel’s frequency agile VS1 transmitter in a 5+1 configuration.